From the Data Flow Run dialog box, you can view detailed reports on any errors that occur while a data flow is being processed. By analyzing these the error reports, you can quickly diagnose the root cause of an error. Each error message provides information about the data flow shape in which the error occurred and a link to a stack trace. You can review the method calls in the stack trace to understand the point at which your application encounters an error and which exceptions are raised. To view the stack trace, click Details in the error message. Optional: To improve the readability of the stack trace, right-click inside the error window, and then click View page source. 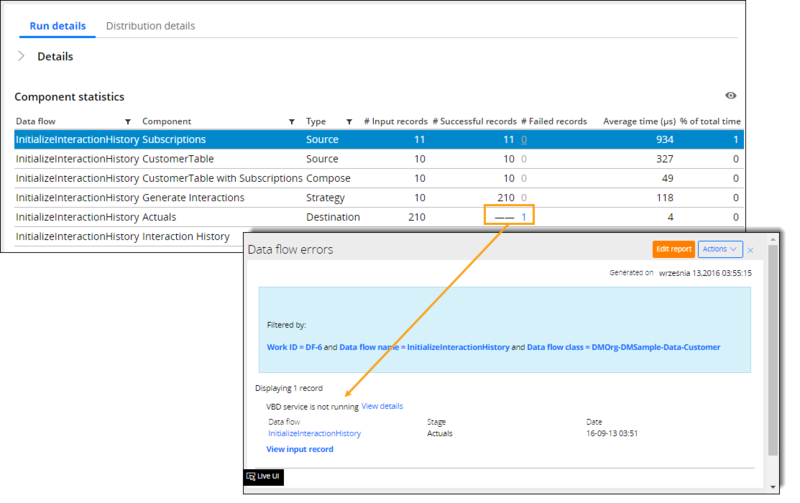 You can view the number of failed records per component in a data flow to detect which shapes are the source of errors. In the Data Flow Run dialog box, click the Run details tab. In the #Failed records column, view the number of failed records that is displayed for the data flow component in which the errors occurred. View the error list per data flow component by clicking the number of errors in the #Failed records column. Click View details to view the stack trace with an error. Click View input record to view the record that caused an error. You can view the number of partitions, which are equal segments of data that are spread across distinctive decision data nodes, that a data flow processes. In the case of an error, you can view on which node it occurred. You can also view the throughput per each node, which might give an indication as to which node is the slowest one. Scroll down to the bottom of the Data Flow Run dialog box. On the Distribution details tab, view the data flow distribution details. In the #Failures column, click the number of errors for the data flow component to view the list of errors. When error details do not give you enough information to fix an error, you can enable debug logging for the com.pega.dsm.dnode package to include more output in the generated log files. For example, you can view the SQL query that was running on an external database table when the error occurred. On the Logs tab, click Logging Level Settings. In the Logger name field, press the Down Arrow key and select the name of a class that starts with (or is in the package) com.pega.dsm.dnode. In the Current level list, select the logging level. For more information, see Logging Level Settings tool. Close the Logging Level Settings window dialog box to save your settings.